Burgers are one of consumers’ most preferred menu items, driven by strong perceptions around their taste, craveability and practicality (convenient and filling). Overall, almost nine in 10 consumers (87%) eat burgers at least once a month. Thus, knowing what types of burgers sell is essential to winning over this large demographic. Although it’s not a necessity, cheese is a major burger component that many consumers believe adds value to a burger. 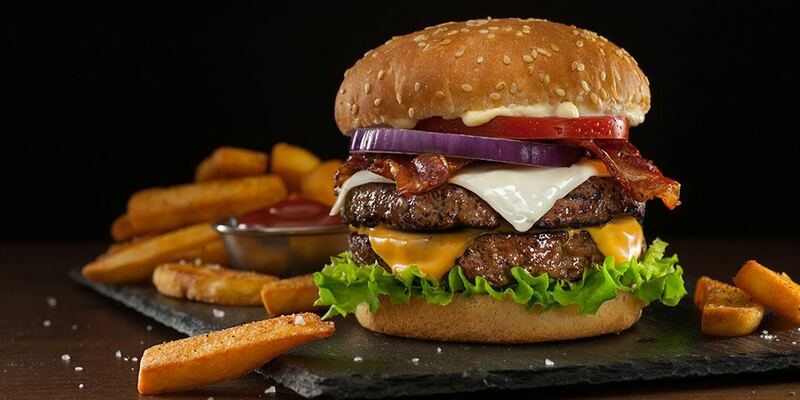 When it comes to consumers’ favorite cheeses for burgers, cheddar leads the pack, with 67% of consumers saying they would consider ordering it on a burger. American and Swiss cheeses round out the top three. And operators are right on track with consumer preferences— the top three cheeses on burgers at restaurants are also cheddar, American and Swiss (in that order). Consumers seem to not only enjoy actual cheese on burgers but also in sauces for a creamy and indulgent bite. 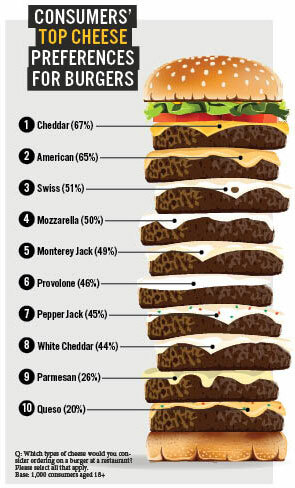 Garlic Parmesan (29%), jalapeño cheese sauce (26%) and blue cheese dressing (23%) all pop up in the top 10 list. Since 50% of consumers prefer a blend of cheese types on their burgers, operators should consider menuing one cheese atop the burger and another cheese infused in a sauce. 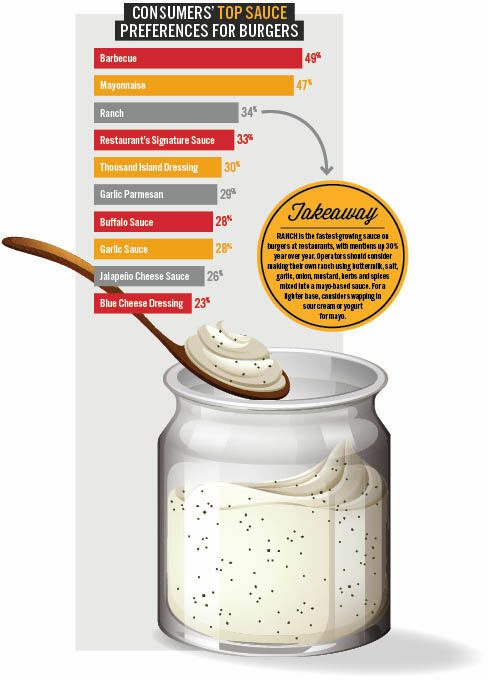 RANCH is the fastest-growing sauce on burgers at restaurants, with mentions up 30% year over year. Operators should consider making their own ranch using buttermilk, salt, garlic, onion, mustard, herbs and spices mixed into a mayo-based sauce. For a lighter base, consider swapping in sour cream or yogurt for mayo. Spicy sauces also seem to be favorites on burgers. More than a quarter of consumers say they would consider ordering Buffalo sauce (28%) and jalapeño cheese sauce (26%) on burgers, both of which have a tinge of heat. And further, although chili sauce and Sriracha don’t make the top 10 list, both are highly prized by certain demographics. For example, 26% of men say they’d consider ordering chili sauce, while 19% of those age 25-34 would order Sriracha. White’s still on trend after Labor Day! White sauces like mayonnaise (47%), ranch (34%) and blue cheese dressing (23%)—as well as crème fraîche and sour cream, which didn’t make the top 10 list— are blank canvasses for innovation. Chefs should consider incorporating fresh herbs, spices and other ingredients into these sauces for a visually appealing and more premium sauce. Because burgers are a perennial favorite, it’s crucial to understand the trends that are impacting this menu segment. Here are five burger trends that operators should keep on their radar. Dips like beer cheese and queso have started to find their way onto burgers. Since cheesy sauces such as garlic Parmesan and jalapeño cheese sauce rank high with consumers, it’s safe to say that these cheesy dips also will appeal to many. Plus, queso’s Hispanic flavorings will entice the 42% of consumers who are interested in ethnic cheeses for burgers. Burgers stuffed with cheese or other ingredients not only surprise guests, but they also make for a well-rounded bite of flavor. Operators can form burgers around a slice of cheese for a shocking burst of gooey goodness. Almost half of consumers (48%) say that natural ingredients make a burger premium, and 70% of consumers prefer natural cheese over processed cheese on their burger. Thus, many operators are touting natural cheeses, and especially aged cheeses, to up the quality. Operators are topping burgers with popular sides like mac and cheese and mozzarella sticks to shake up menu offerings with a familiar format. These over-the-top, wow-factor items appeal to folks looking for an indulgent bite. Upscale cheeses like truffle-flavored or chili pepper-tinged varieties give burgers a more premium image. Upscale sauces also do the trick. A benefit for operators: adding a premium topping is traditionally less expensive than switching to a pricier patty. So consider upscaling toppings before other ingredients.